Protein-rich chicken, creamy ricotta, and a rich marinara sauce bring classic flavors to this reimagined chicken roll. 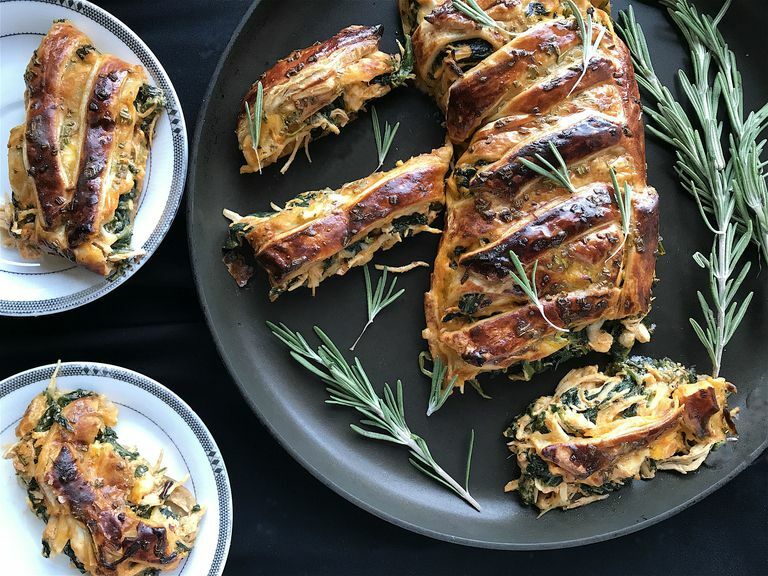 There's just enough cheese to mix into the spinach and chicken filling—enough to ooze out with every bite—and it's all wrapped in a flaky puff pastry crust brushed with warming rosemary oil. No fancy pastry chef skills are needed to make this recipe or enjoy it. Each slice is about 174 calories—comparable to a piece from the pizzeria ​but packed with more nutrition. Thaw the puff pastry by letting it stand at room temperature for about 10 minutes and preheat the oven to 450F. Have a large baking sheet handy. Add oil and garlic to a large skillet and cook over low-medium heat, until garlic is fragrant and slightly golden, about 3 minutes. Be sure to stir it and watch it so that it does not burn. Pour oil from the skillet into a small bowl. Add minced rosemary to the oil and let stand. Keep garlic in the skillet. Add spinach to the skillet and cook over medium-high. Use tongs to toss it. Cook until just wilted, about a minute and a half (you don't want to overcook it or have a lot of liquid released). Remove from the skillet and let stand at room temperature for ten minutes. While the spinach is cooling, place your puff pastry dough on a large piece of parchment paper. Roll it into a 20x8-inch rectangle. Drain any liquid released from the spinach and combine it with marinara sauce, shredded chicken breast, and ricotta cheese in a medium bowl. Stir well to combine. Drain any excess liquid out. Spoon the spinach chicken mixture down the center of the puff pastry dough, leaving about 2.5 inches on each side and an inch at the top and bottom. Sprinkle the mozzarella on top. Use a sharp knife to cut 1-inch diagonal strips on both sides, stemming from the filling to the edge of the dough. Fold the strips in a criss-cross pattern across the filling, pinching the edges into the dough on the other side, and tuck the top and bottom in towards the filling. Pick up the edges of the parchment paper and transfer the roll to the baking sheet. Brush the rosemary oil over the top and sides. Bake at 450F until dough is lightly browned, about 15 to 17 minutes. Let cool slightly before slicing into 1.5-inch pieces and serving. You have a few options for the shredded chicken breast. Using ready-to-eat rotisserie chicken breast will save you the most time. Make sure to omit the skin. Six ounces yields about a cup and a half. Enjoy the rest of the chicken for a different meal. Alternatively, you can poach a 6-ounce chicken breast. Cover a 6-ounce chicken breast with water and 1/2 teaspoon of salt and let simmer on the stovetop until cooked, about 20 minutes. To practice proper food safety, use a food thermometer—it should register at 165F. Let the chicken cool slightly before shredding with two forks. You can make your own marinara sauce to better control the sodium or use a jarred sauce. When choosing the best brand for you, compare nutrition labels and ingredient lists. Opt for plain marinara sauce—nothing with meat or extra herbs—and pick a brand that offers the lowest sodium per serving. It's okay to use a few ounces more or less of spinach, depending on your preference and what you find in the store. You can use pre-packaged pizza dough instead of puff pastry for a crust that isn't as flaky. For an easier fold, skip cutting the strips and simply fold over each side of the dough until they meet in the middle. Pinch together to seal.